Monday.com is how popular CRM & collaboration system dapulse is called nowadays, following a large rebranding campaign. Next to being one of the most attractive CRM solutions, Monday.com is known to the corporate community as one of the leading project collaboration & communication solutions on the market. It tends to simplify customer and project management by syncing and organizing information in a centralized database, and making it possible for team members to make decisions together. It is versatile, but yet very compact, and possesses multiple one-of-a-kind features that brought it our prominent Supreme Software, Great User Experience, and Expert’s Choice Awards. From a CRM point of view, one could confidently qualify Monday.com as the system that brings complex operations under one roof. You can use it to easily manage pipelines lead-to-project, consolidate the information on your contacts in a central database for streamlined communication, and accelerate sales thanks to complete visibility. On top of that, you can customize your customer management portal in many different ways, until it suits your exact needs. Monday.com ensures that all departments are well connected and able to contribute to each other, regardless of the size or type of company that uses it. Progress is monitored and measured in a very understandable fashion, and that makes it easy for agents to estimate how far operations got. Monday.com doesn’t fall short on providing incentives for employees to contribute, as they also get a role in tasks that don’t concern them directly. Monday.com is also known for accessibility and user-friendliness, given that it comes with a collaboration-first interface, and enables an agent-to-agent and agent-to-client relationship reminiscent of social media interactions. To get around Monday.com, you won’t need any special training or preparation – it takes less than a month for the entire team to embrace it. What is more, the system is moderately priced and caters to the the needs of different market tiers, and is therefore suitable for small and novice teams. A free trial is also available for those interested to test this system. Monday.com is unique in many different ways, and serves an array of corporate needs which makes it more competent than a suite of multiple business applications. Under the name of Dapulse, this product gained significant recognition in the industry, and is still referred to as the most transparent CRM, project management, and collaboration package. What teams like the most about it is its intuitiveness, and the possibility to customize nearly everything. Monday.com is the perfect tool to substitute messy spreadsheets and get a CRM of your own without paying a fortune for it. Instead of running a third-party system to manage customers; and consolidating data from your other productivity tools, Monday.com gives you the opportunity to handle both your projects and your customers from a single visual platform. What is better, it makes this process very easy and transparent. Monday.com manages and tracks your leads and projects from the same dashboard, providing you with all contact information to ease communication. You can track your prospects, clients, and deals as easily as you manage your to-do-list, and administer your lead pipeline up to the post-project phase. Such visibility will speed up your sales processes and enable you to provide accurate information, and simplify most of your day-to-day operations. Another thing that makes Monday’s CRM module unique is customization, as you can tweak literally any detail in your customer management hub. The program allows you to sort, filter, and customize data until you set the system to work the way you want it. On top of that, Monday.com is a lightweight CRM solution which is considerably easy to use, and requires no time-consuming training or preparation. Regardless of how you’ve modified the system, Monday.com will retain control on changes, including replaced dates and statuses, re-positioned agents, dismissed actions, and more. With Monday.com, there is little chance that something can go wrong or slide through the cracks, and even if it does – the system will make expose the person that caused it. Monday’s core capability is streamlined collaboration, as the system enables agents and departments to assist each other without any problem. They can contribute to tasks, make comments, trigger questions or discussions, and even suggest solutions for tasks they’re not directly concerned by. Doing so will be even easier thanks to social-media-reminiscent interface; and the possibility to upload and share files. Monday is well integrated with leading social networks, and comes with an activity feed where you can follow the progress of each operation. Monday.com employs an out-of-the-box Board concept that generates detailed insights on your products and tasks, or upon need information on your contacts and clients. This makes it easy to follow the company’s performance and to ensure that each client gets the assistance he needs. Interestingly enough, Monday.com allows external users and partners to follow the progress of projects, and notifies them with special alerts in case they don’t have a Monday.com account. In a similar fashion, managers can follow and evaluate the performance of agents, teams, and entire departments. Monday.com is also well known for reporting and analytics, as it collects and arithmetically relates projects and tasks, and relies on these connections to organize them in a historical datasheet. Consequently, it provides managers with clear figures, organized, and instantly operable metrics; and makes sure that the database is constantly updated and fully exportable to third party systems. Integration is another strong side of Monday.com, as the tool simply blends in any software ecosystem where it is applied. 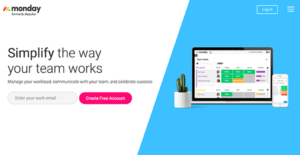 You can build custom connections to any third-party app, or use its native integrations with Zapier Google Drive, Dropbox, and other leading systems. There are well-liked and widely used systems in each software group. But are they necessarily the best fit for your organization’s unique requirements? A popular software application may have thousands of users, but does it provide what you require? For this reason, do not blindly invest in popular systems. Read at least a few Monday.com CRM reviews and consider the aspects that you desire in the software such as the cost, main features, available integrations etc. Then, choose a few systems that fit your requirements. Check out the free trials of these platforms, read online reviews, get information from the seller, and do your homework meticulously. This in-depth research is sure to help you choose the most excellent software platform for your company’s unique needs. How Much Does Monday.com CRM Cost? For your developers: use our API to move information from 3rd party systems to monday.com (and from Monday.com to other systems.) It automates tasks and saves time. We realize that when you make a decision to buy CRM Software it’s important not only to see how experts evaluate it in their reviews, but also to find out if the real people and companies that buy it are actually satisfied with the product. That’s why we’ve created our behavior-based Customer Satisfaction Algorithm™ that gathers customer reviews, comments and Monday.com CRM reviews across a wide range of social media sites. The data is then presented in an easy to digest form showing how many people had positive and negative experience with Monday.com CRM. With that information at hand you should be equipped to make an informed buying decision that you won’t regret. What are Monday.com CRM pricing details? What integrations are available for Monday.com CRM? Pros: Every team within our organization want to manage things differently, thankfully Dapulse offers great flexibility to do so. The design is simple and beautiful one. With trafic light system we can gather visual snapshot of any team members productivityand it is a perfect solution for understanding account manager capacity. Cons: It has some glitches, and it would be great if the micro task boards could be linked to the high level boards. Pros: "Pretty" high level view of your tasks. There really aren't any further, "best aspects" to the product. They provided many empty promises that I later found they never will implement. Cons: It's a single level, high level view with no "meat" beyond that. No dependencies, no true links between tasks, etc. Ease of use, simplicity, functionality, and the customer support team has been outstanding! Task Management and Organization Tool That Works! An excellent project management tool across organizations. If you need more information about Monday.com CRM or you simply have a question let us know what you need and we’ll forward your request directly to the vendor.